The Branx Fitness ‘Cardio Pro’ Treadmill, boasts of its touchscreen console which is not integrated into a lot of running machines today. But aside from this, there’s more to like about this model as it has a wide range of speeds, a powerful motor, a large running deck area and more! Branx Fitness is a UK brand that manufactures different fitness machines, and in particular, their Branx Fitness ‘Cardio Pro’ has satisfied a lot of customers. Keep on reading as I’ll be looking further into the specifications of this mid-range level treadmill. 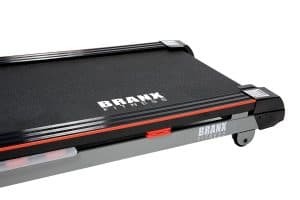 The Branx Fitness ‘Cardio Pro’ Treadmill is driven by a powerful 6HP Peak motor (3.5 CHP Motor) that ensures the product will last long even after enduring continuous heavy use. 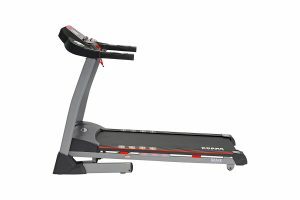 It also has a durable frame that almost makes comparable to other “gym quality” fitness equipment. This home treadmill has a maximum user weight of 130kg which makes it a reliable machine as it can carry a large amount of weight. People who have purchased the product left positive reviews and most of them say that it’s sturdy and that they are satisfied with it. Whatever your fitness goals are, this treadmill will undoubtedly have a program that’s suitable for you. It has 99 programmes to choose from which make every workout session fun and challenging. This treadmill probably has the most number of workout programmes I’ve ever seen on a home treadmill. The Branx Fitness ‘Cardio Pro’ Treadmill has a top speed of 10km/h and 0-15 auto-incline levels which will allow you to make the most out of the indoor running. 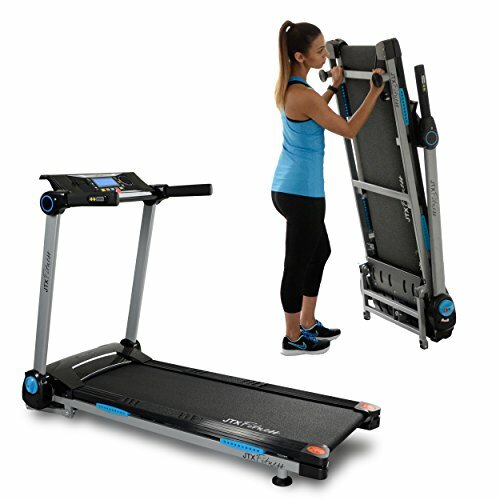 Branx Fitness ‘Cardio Pro’ Treadmill features a running deck that includes a Shock Absorbing 24-Point Cushioned Running Deck Suspension System. This will lessen the pressure on your joints, and may even make you look forward to your next workout session. The comfortable running area measures 135 x 48cm, this lets you simulate a real running experience. One of the highlights of the Branx Fitness ‘Cardio Pro’ Treadmill is its 7-inch touchscreen console. You can control and adjust the settings of this running machine with just one touch on the screen. Aside from displaying all your data like speed, distance, time, BMI, and pulse, the console also has a built-in MP3 socket with speakers to keep you entertained whilst walking or running. Building a home gym with limited space is possible because of the space-saving design integrated into most home treadmills today. The Branx Fitness ‘Cardio Pro’ Treadmill is even easier to store because it’s supported by a hydraulic arm underneath when folding, so you don’t have to lift the massive machine. This treadmill comes pre-assembled, and will, therefore, require minimal assembly once it arrives. However, some people who purchased the item say that instructions were quite hard to understand, which therefore made further assembly frustrating. Nonetheless, the positive reviews left on the Branx Fitness Cardio Pro Treadmill still outnumbered the negative ones, so I guess the instructions were not a big deal after all. The JLL S400 Premium Digital Motorised Treadmill is offered at a mid-range price, but it’s a high-quality product that provides a great user experience. 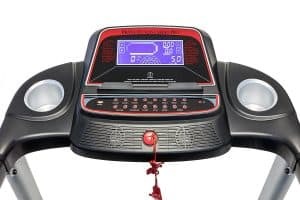 It has similar features to the Branx Fitness Cardio Pro Treadmill, and you’ll be thrilled to know that this one is Bluetooth-enabled and has built-in speakers which means you don’t need to plug in your device to play your music. Just connect it to the treadmill, and you can listen to your favourite workout playlist! This treadmill also has an accommodating running area that measures 135c x 45cm so you won’t feel restricted no matter your foot stride. The running deck is also comfortable with a 16-point cushion that helps reduce the impact on your joints. JLL S400 Premium Digital Motorised Treadmill Detailed Review? CLICK HERE. Coming from a well-known Sports brand, the Reebok ZR8 Treadmill is a piece of home fitness equipment you should definitely consider. It’s a durable treadmill that has a total of 31 programmes – with 24 preset programmes plus body fat, three target programmes and three user-defined programmes. The 126 x 41cm running deck on this running machine is integrated with ZigTech deck cushioning that reduces stress in the glutes, hamstrings and shins when working out. 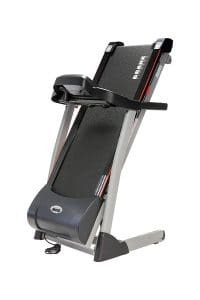 It has a top speed of 16 km/h, 15 auto-incline levels, and a maximum user weight of 120kg, which when all added up, gives you a great value for your money. Also, using and storing this treadmill won’t stress you out because of its soft drop mechanism – meaning its supported with a hydraulic arm. 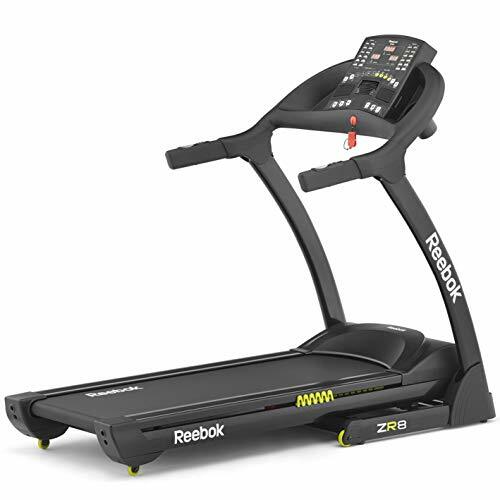 Reebok ZR8 Treadmill Detailed Review? CLICK HERE. This treadmill is claimed to be the most compact home running machine available on the market today. 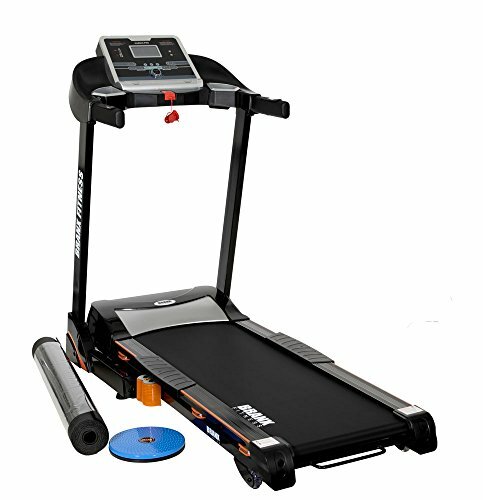 JTX Slim-Line Treadmill is flat-folding so that you can store it even in the most limited spaces, even under your bed! Although it’s compact, it still offers a wide running space that measures 125cm x 41cm, and it has a large digital display to keep track of your progress. Its console comes with a JTX DiscTech system which enables you to quickly adjust your speed up to 14 km/h with just a swipe of your finger. This treadmill has 15 levels of incline, seven workout programmes, a built-in speaker, and hand pulse sensors. Its 125 x 41cm running surface also has an 8-point shock suspension system which makes working out easy on your joints. 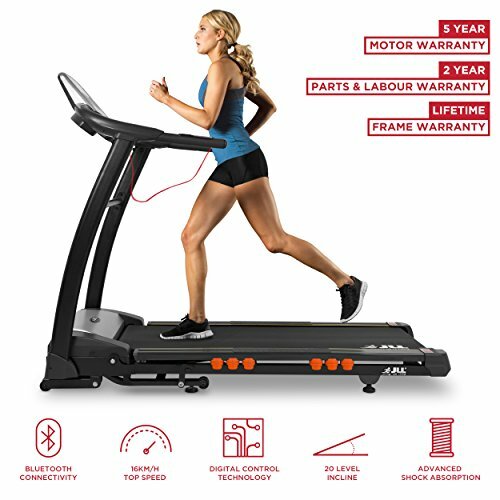 JTX Slim-Line Treadmill Detailed Review? CLICK HERE. 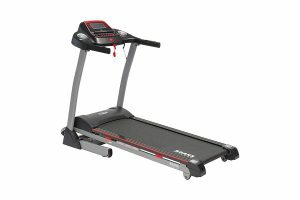 If you’re looking for a treadmill with a wide running area, the NordicTrack C100 Treadmill should be one of your choices. It has a 140 x 51 cm running surface size and a 125kg maximum user weight which makes it great for both beginners and pros. The console of this treadmill has OneTouch Quick Keys, so it’s easy to operate and adjust the settings based on your own pace. This durable piece of equipment has FlexSelect Cushioning that allows you to choose between a comfortable and intense workout. This cushioning system can change from a soft running deck to a firm surface that stimulates the feeling of running on the road. NordicTrack C100 Treadmill Detailed Review? CLICK HERE. For a mid-range priced treadmill, the Branx Fitness ‘Cardio Pro’ Treadmill has a lot to offer. Starting with its 99 programs, you’ll be able to challenge yourself with every workout session. 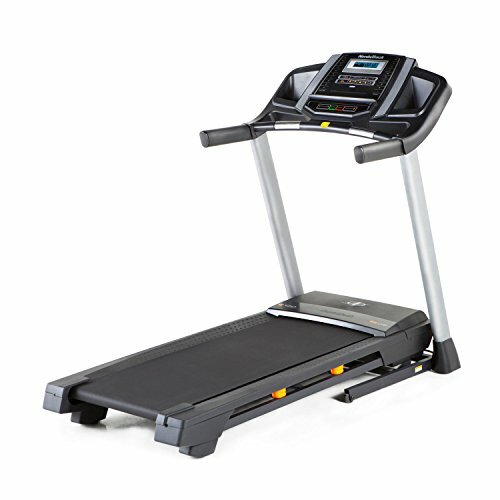 It’s durable, with 130kg maximum user weight, and it has a wide range of speed and auto-incline levels. On top of that, it has a large LCD touchscreen console, and it comes with a one year warranty on parts and labour, plus a 2-year warranty on frame and motor.